React to market changes and changing customer requirements faster. codeBeamer ALM’s Demand Management tool gives you a competitive advantage by allowing you to identify and prioritize market demands and promising projects efficiently, and to manage those projects throughout their lifecycles. codeBeamer’s Demand Management tool functionality, fully integrated in its ALM capabilities, supports your internal decision-making process in order to enhance the performance and profitability of your entire organization. It helps you capture ideas for new projects, analyze them in detail to identify the most promising opportunities, and collaboratively vote on these projects to prioritize them. After you’ve made a decision, selected projects can be started, managed and monitored throughout their lifecycles all within codeBeamer ALM. This helps ensure transparency, consistency, and traceability in all your projects, from idea all the way to the maintenance of the delivered product. 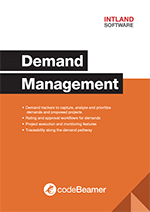 Use domain-specific demand trackers to gather ideas, demands, and proposed projects from various departments & teams. Configure your own trackers to add fields and data types, manage permissions, and set notifications for each demand. Evaluate the costs, benefits, and risks of proposed projects easily, with customizable fields and permission control. Enhance collaboration and the flow of information among team members, allowing you to make informed decisions about proposed projects. Rate projects collaboratively by voting on each demand. Compile and visualize a priority list of proposed projects. Set automatic e-mail notifications to ask for votes, enforcing timely responses and set decision-making processes. Implement a demand approval workflow to map your decision hierarchy within the company. Use a Kanban board with WIP limits to visualize and manage the statuses of all demands.